A beautifully detailed model, and a very simple kit to build. This kit is based on the US 3/4 ton Light Truck WC 51 kit. Like that kit, this one has a very detailed suspension, excellent driving compartment, and well detailed flatbed. 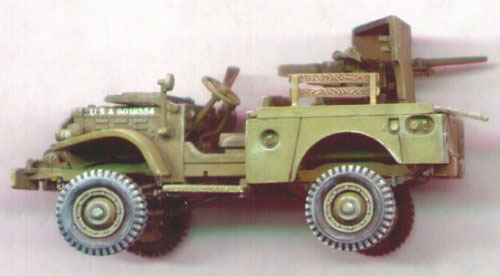 This GMC (Gun Motor Carraige) kit contains a different flatbed for the 37mm anti tank gun mounted in the rear. It has ammunition storage bins with positional covers, the windshield can be positioned up or down (but no clear plastic is included), a winch is included for the front bumper, and plenty of stowage for the outside, such as tools, gas cans and bedrolls. The gun is simple, but very well made. With decent photos, I'm sure a super-detailer could add more to the gun, but it looks very good right out of the box. The gun shield is very thick, however. Perhaps this was the limit of model making technology 20 years ago when this kit was released, but today, hopefully, similar parts can be made much thinner. The bedrolls are stiff and lifeless, but the rest of the external equipment is pretty good. There's really not a whole lot to say about building this kit. The construction was very straight forward and simple. No fit problems anywhere. The figures are actually not too bad. The driver is fairly decent, and the gun loader, but a couple of passengers are pretty stiff. I painted my kit in AeroMaster Acrylic Faded Olive Drab. I have heard from other modelers that the suspension is far too high, which you can see in the above scan. I have no drawings of this vehicle, so I don't know how much it needs to be lowered to be corrected.